Call to engage in a continent-wide democratic debate on the deep crisis facing the European Union and how to overcome it. 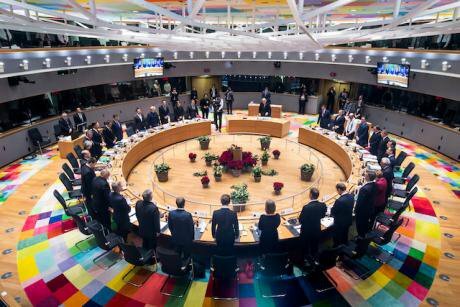 Minute silence observed by EU leaders for victims of Strasbourg Xmas market shooting at the EU Summit on Brexit. Enzo Zucchi/Press Association. All rights reserved. At the end of the Colloquium "Revisiting Solidarity in Europe", held on 17 and 18 June, 2018, whose works are accessible online on the Collège de France website, a number of academics gathered on this occasion agreed to prepare a discussion-opener for various major European newspapers to engage in a continent-wide democratic debate on the deep crisis facing the European Union and how to overcome it. To date, this call has been published in Germany by the Frankfurter Allgemeine Zeitung, in Portugal in Il Publico, in France in Le Monde, in Greece in Ta NEA, in Poland in Rzeczpospolita, and in néerlandais in Belgium. Here is the English version. Can European integration continue on its present course? Since 2005, and the failure of the Constitutional Treaty, Europe has been coming apart at the seams, yet nothing seems able to wake its leaders from their dogmatic slumber. Nothing: neither the repeated electoral defeats, nor the economic rifts between Eurozone countries, nor the bailouts of irresponsible banks from the taxpayer’s pocket, nor the agony Greece had to endure, nor the inability to formulate a collective response to migration flows, nor Brexit, nor the feeble response to American diktats which fly in the face of signed treaties, nor the rise of nationalism and xenophobia – none of these have managed to force onto the agenda a European-wide democratic debate on the profound and troubling crisis the Union is facing, and how to resolve it. Naturally, in the absence of a European-wide public forum, EU policies can only be discussed at the national level. And since this is not the level at which European policies are decided, there seems to be no choice but to support Europe, warts and all, or leave it. Albert Hirschman famously showed that there are three options open to members of an organisation in crisis or decline: they can criticise it in order to reform it from within ("voice"); they can leave it ("exit"); or they can neither leave nor criticise it, even if they are dissatisfied, but stay out of loyalty ("loyalty"). Since Europe's citizens have no voters’ power over the real decision-making bodies of the EU (the Commission, the Court of Justice, the European Council and the Central Bank), they feel deprived of a "voice", and forced to choose between leaving or loyalty. This is why ‘debates’ on the EU within Member States are invariably caricature jousting matches between the "pro-" and the "anti-". All those who criticise the EU's functioning are classed as "anti-". Their numbers increase daily, swelled by the growing ethno-nationalist parties and governments. We consider this binary logic to be both false and suicidal. It is untrue to say that we are confined to blindly supporting European institutions as they are, or rejecting them entirely. The paralysing poles of Euro-worship and Euro-nihilism prevent us envisaging democratic reform of the EU. And if the latter is not taken seriously, then Europe will indeed end up disintegrating, spawning particularist tensions and acts of violence as it does so. Yet we require European solidarity more than ever today, to tackle cross-border issues such as environmental protection, migration, new technologies and geopolitical stability. We, the signatories of this text, are not “experts” telling populations or their leaders what to do. We are researchers from different political horizons who, studying the workings of the European Union from the perspective of different Member States, have come to the same alarming conclusions about how it functions. The first cause of the growing disaffection for the European Union is the gap between the values it proclaims and the policies it makes. Its values are enshrined in the Charter of Fundamental Rights of the European Union, which declares that "the Union is founded on the indivisible, universal values of human dignity, freedom, equality and solidarity; it is based on the principles of democracy and the rule of law." The EU's most blatant failure concerns the principle of democracy, but arguably the principle of solidarity fares little better. The EU's most blatant failure concerns the principle of democracy, but arguably the principle of solidarity fares little better. "Abdicating democracy", he said, "can come about in two ways, either through an internal dictatorship that concentrates all powers in a providential man, or through the delegation of those powers to an external authority, which will in fact exert political power but in the guise of technical expertise. For, in the name of a healthy economy, one can easily impose a monetary, budgetary and social policy, which add up to a “political agenda”, in the broadest sense of the term, both at national and international level." “the people must be able to determine government and legislation in free and equal elections. This core content may be complemented by plebiscitary voting on factual issues (…) In a democracy, the decision of the people is the focal point of the formation and retention of political power: every democratic government knows the fear of losing power by being voted out of office”. The European Union is no democracy by these standards. It does not hold elections which would allow a structured opposition to take shape and come to power on an alternative programme for government. In a recent book entitled Europe, yes, but which?, a former member of this Court, the eminent jurist and scholar Dieter Grimm, attributed Europe’s democratic deficit to the fact that economic policies which should normally be decided by successive national governments are actually prescribed in European treaties. This "hyperconstitutionalisation", he argues, results in Europe being at odds with its declared values and principles, and abandoned to what Jürgen Habermas has called a “post-democratic executive federalism”. Strikingly, as early as 1939, Friedrich Hayek, an architect of neo-liberalism, advocated just such a Federation of States grounded in the “impersonal forces of the market”, as the best organisation, in his view, for fending off the “legislative interferences” of its democratically elected governments (regarding monetary, work and welfare, and fiscal policies), with the added advantage of dissolving all sense of solidarity, whether social or national. And indeed, the corrosion of systems of solidarity – public services, and labour and social security law – is one of the most visible effects of European integration, and the primary factor in its disintegration. In this too the EU has betrayed its founding values, especially since the principle of solidarity, extended to environmental protection, was one of the most innovative points in the Charter of Fundamental Rights of the European Union. Already in the 1990s, certain authors (J. Weiler, F. Scharpf) were pointing to the discrepancies between Europe’s expanding competence to dismantle national solidarities in the name of economic freedoms, and its failure to build European-wide solidarities which would ground its political legitimacy and social cohesion. With the preeminent role given to the “impersonal forces of the market” in Europe today, solidarity is treated as an obstacle to be eliminated, or at least reduced. So the EU continues to organise the race to the bottom between its Member States in work, welfare, tax and environmental protection regulation, within an institutional structure particularly exposed to the pressure of lobbies, in the absence of democratic processes. So the EU continues to organise the race to the bottom between its Member States in work, welfare, tax and environmental protection regulation… in the absence of democratic processes. After reneging on its promise to build a “Social Europe” and achieve “improved working and living conditions, and their harmonization while the improvement is being maintained", the EU has settled for a “Pillar of Social Rights”, as a minimal safety net for the casualties of its enthusiastically pursued “deregulation of the labour markets”. We have seen one instance of solidarity, however: the ailing banking sector received colossal sums in an agreed rescue plan, which transferred the banks’ losses onto the European taxpayer, and plunged whole countries into poverty. No serious reform of the banking system was tied to this plan, and the European leadership did not even see fit to call the banks themselves to account, not even the bank Goldman Sachs, which had helped cook the books of Greece’s public deficit. But we should not forget that many European leaders had worked for the bank in the past, and would even return, in the case of a former President of the European Commission. The illusion fostered by neoliberals is that human society can dispense with solidarity and common purpose, leaving only competition between its members. Yet no society can endure without solidarity, and this need must be answered not by ethnic or religious particularist groups, and the forces of demagogy and violence they unleash, but by democratic institutions. Wherever we look – the USA, India, the UK, other European countries – demagogues thrive on denouncing social inequalities, attributing them to the presence of foreigners, but they fail to tackle their real economic causes because they hold the same neoliberal convictions as their “open borders” opponents. The latter treat a country’s historical and cultural legacy as an archaic relic, and advocate a liquid and uniform world to come. It should be recalled that after the bloodshed of two World Wars, the international community unambiguously pronounced, in two key texts – the Constitution of the ILO (1919), and the Declaration of Philadelphia (1944) – that “lasting peace can be established only if it is based on social justice”. Lasting peace was also the goal pursued by the founders of the European Economic Community, but they held that the economic detour of a common market, which was to automatically produce a “space of liberty, security and justice”, would itself lead Europe to political unification. Unfortunately, this detour has become an end in itself, and subsequent Charters or Treaties enshrining other values have not yet succeeded in placing the interests of society above economic interests. The crux of the matter is therefore whether the fundamental principles of dignity, democracy and solidarity enshrined in the European Charter and the Treaties are simply a cosmetic legal gloss to give a human face to the “impersonal forces of the market”, or whether it is still possible to channel the latter, “embedding” the market in European society, and subordinating it to these principles. This is the crucial issue we should address in the upcoming European elections. We trust that it is still possible to breathe fresh life into the European Union, by holding to these ideals against the economic and monetary dogmas that lead to its destruction. The EU will only regain its credibility and legitimacy if it shows itself to be a Europe of cooperation not competition. A Union which treats its extraordinary diversity of languages and cultures as a strength, rather than seeking to flatten or standardise them. A place of European-wide initiatives to address those problems (and only those) which no Member State can tackle on its own. And solidarity should not be confined to relations between Member States. It should also operate externally, through cooperation with other countries sharing similar goals, starting with our closest neighbours. Given its economic strength, only the EU can effectively combat what Franklin Roosevelt called “organised money”, by separating retail banking from investment and corporate banking, and limiting the banks’ power to create money. Only the EU can oblige economic operators on the continent, whatever their nationality, to comply with regulations which get to grips with serious environmental threats, soaring inequalities, and destructive competition between taxation regimes, which lead to worsening public facilities and services, and run-down road and rail infrastructures. Only the EU can devise a common legal framework to support the growth of a social economy between Member States and the market, based on the principle of solidarity, to foster commons and the many forms of social solidarity. In the field of technology, Europe alone is capable of supporting key European firms committed to preserving fundamental freedoms against the monopolistic practices of GAFA today, and Chinese companies tomorrow. It alone can organise a robust legal response to the extra-territorial application of American laws to European companies. And it alone has the means to build strategic partnerships with African countries that do not drive them into the ecological and social disasters of neoliberalism, but allow them to define their own path of sustainable development, grounded in their own cultural heritage. Europe alone can propose a balanced approach to the migration crisis, by not giving an inch to the demagogues regarding the rights and dignity of migrants and asylum seekers, while helping concretise the measures enabling individuals – whether from Senegal, Italy, Mali, Tunisia or Greece – to live decently from their work in their own country, without being forced into exile. Refounding the EU on the principles it has proclaimed, and on Member States’ common constitutional traditions, is conditional not simply upon restoring, but on deepening democracy at all levels of political decision-making (local, regional, and European). This project has already produced exciting ideas, such as Michel Aglietta and Nicolas Leron’s return to the origins of our representative democracy (“no taxation without representation”), with their plan of creating an EU budget (by taxing financial transactions) earmarked for cross-border sustainable development projects ratified and monitored by the European Parliament. Symmetrically, Member States would regain control of their own budgetary decisions, without which a democracy loses its substance. The knock-on effect of the situation to date has been the devitalisation of all forms of local and social democracy, drained of their resources by governments fixated on the governance by numbers prescribed to the Eurozone. In Etienne Balibar's words, what is required now is not a return to or restoration of the traditional forms of democracy, but its genuine rebirth, at all political levels. Without a real democratic renaissance, the “leadership elites” will remain cut off from the infinitely rich and varied spectrum of Europe’s populations, and will abandon them to the demagogues. This text is the result of a discussion held in the framework of the Conference “Revisiting solidarity in Europe”, which was held on 18 and 19 June 2018 at the Collège de France in Paris. This article was translated from the French by Saskia Brown.